The conference was opened by a film in memory of the outstanding armwrestler, the undefeated PAL World Champion, the multiple World and European Champion Andrei Pushkar. All the stars of the world arm wrestling, as well as all those present at the conference honored the memory of the Champion with a minute of silence. Then Igor Mazurenko invited all the participants of the “Vendetta All Stars 50” to the stage and made a speech about how the whole community grieves the loss of Andrei Pushkar and wished another world champion, Oleg Zhokh, who suffered in the same car accident, the soonest recovery. All the stars of armwrestling on stage joined him, adding a few words from themselves. After that, those present at the press conference watched the film, which will be at the opening of “Zloty Tour” - “The Legend of the Zloty Tour”. Then came the time for questions. Igor Mazurenko asked many interesting questions to the athletes, some of them were accompanied by videos. Journalists and spectators also asked questions about the training and the expectations of athletes from the upcoming fights. 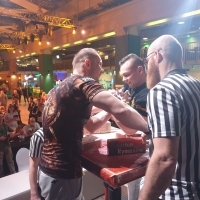 As a result, a lively discussion ensued on the stage, Devon Larratt and Denis Tsyplenkov even gave a demonstration “warming up”, for which they brought an arm wrestling table to the stage! Answering the questions, the athletes made it clear that each of them went through a very difficult way of preparing for the biggest and “star” Vendetta, which will take place on Saturday and Sunday and everyone is ready to give everything to the full for the sake of victory. Apparently, as expected, it will be an uncompromising battle of the best athletes of the world on the same stage. But the press conference did not end by the questions section. Igor Mazurenko presented to the audience a United Professional Arm Wrestling Rating and it's top division - “TOP 8” Division! The Armwrestling Professional League plans to launch the rating in 2018 already and the first tournament of the “TOP 8” division will be held in 2019. The eight world’s strongest athletes will take part in three events with a final prize fund of $ 121,000. Watch the press conference “Vendetta All Stars 50” at www.armbets.tv for free after registration! “Zloty Tur” Professional World Cup 2018 has opened in Rumia, Poland! Andrey Pushkar’s spirit is with us! “Vendetta All Stars 50” Press-conference.